Ariel Kachuro/Assistant Photography Editor Redshirt junior infielder Alex Baratta hit an infield RBI double in the second game of Binghamton’s home doubleheader against Maine. 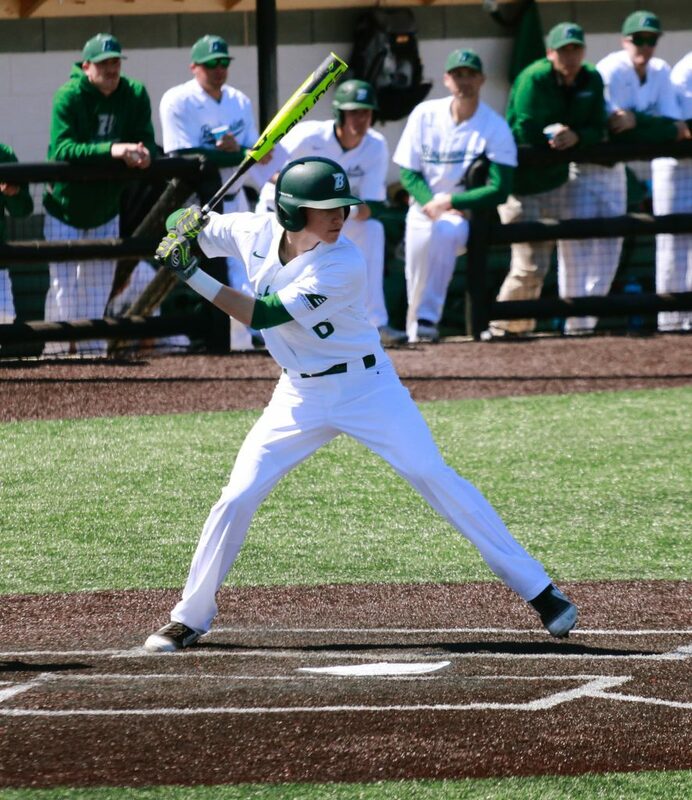 Coming off a two-game series with Kennesaw State University, the Binghamton baseball team split a pair against Maine to open conference play. Despite being blanked 8-0 in the first game of the doubleheader, the Bearcats (8-9, 1-1 America East) rebounded to take the nightcap, 4-1. For BU, the matchup presented what should have been a relatively easy opportunity for the team to start the America East portion of its schedule 2-0. The Black Bears headed into Vestal with an uninspiring 1-17 overall record. Undeterred by the lack of success thus far this season, Maine dominated the opener, posting runs in six out of nine innings. Senior pitcher Nick Gallagher, who is now 0-3 on the season, started for Binghamton in the first game of the series. After surrendering four runs to Mercer in his previous start in 4.2 innings, Gallagher repeated this line against the Black Bears as his ERA rose to 5.54 on the season. After Gallagher allowed four runs by the middle of the fifth inning, BU head coach Tim Sinicki inserted junior pitcher Jake Miller in relief. Unable to stop the bleeding, Miller also gave up four runs in 3.1 innings pitched. The Black Bears combined for eight runs on 12 hits against Binghamton’s rotation. In addition to the Bearcats struggling from the mound, the team was also stagnant offensively. Black Bears senior right-handed pitcher Nick Silva, held BU scoreless, despite only striking out two batters and walking three across eight strong innings. Sophomore outfielder Shane Marshall led the team with two hits in three at-bats as Binghamton left eight runners stranded in the 8-0 shutout defeat. Despite the rough showing in the opener, the Bearcats bounced back both from the batter’s box and the mound to split their series. Marshall and redshirt junior second baseman Alex Baratta accounted for four of six hits BU put together. The duo collected a pair of infield RBIs in the third and fourth innings, respectively. Even though Binghamton had its bats going, junior pitcher Ben Anderson was indisputably the difference maker, as he pitched six nearly flawless frames with MLB scouts in attendance. Anderson fanned a career-high 10 Black Bears while only giving up four hits, two walks and one earned run. The 3-1 pitcher now has 42 strikeouts in 31 innings on the year to lead the America East. After splitting the doubleheader, the team will head to University Park, Pennsylvania to battle Penn State in a one-game nonconference stint on Tuesday. The Nittany Lions (13-6, 0-3 Big Ten) were swept by Minnesota in their most recent series this past weekend. Penn State is headlined by senior outfielder Jordan Bowersox, who bats .319, and sophomore relief pitcher Mason Mellott, who sports a 1.52 ERA in nine appearances. BU will return to conference play next weekend when it faces off with Albany. The Great Danes (6-9, 1-2 AE) travel to UMass and Iona on Tuesday and Wednesday, respectively, before they play the Bearcats on Saturday. First pitch against Penn State at Medlar Field is scheduled for 6:30 p.m. on Tuesday.